Our business was founded on this simple promise—stand behind your work and your word. That tradition carries on today. We started the business in 1945 based on honesty and integrity—and we haven’t changed a thing. At Daiker Heating & Air Conditioning, we offer reliable, top-notch service, installation, and repair for all of your heating, cooling, and indoor air quality needs. Our team of expert technicians can service any make or model and they get the job done right the first time. A key, but not commonly thought of area is air quality—our techs will measure your air quality and recommend necessary products, like humidifiers/dehumidifiers, air purifiers, air ventilators, and more, to fix any present problems. Over the decades, products and technology may have changed, but our commitment to customer service has not. All of our staff members are EPA certified, so you can be sure they know their stuff. But more than that, we are your neighbor in Waukesha, Delafield, Pewaukee, Brookfield, Muskego, Mukwonago, and the surrounding areas. Our connection to our communities and our service pledge remains the same. Our neighborly service also extends to area businesses, as we can help you with all your commercial heating, cooling, and indoor air quality needs. We know it takes a professional close to home to deliver the products and services you need. 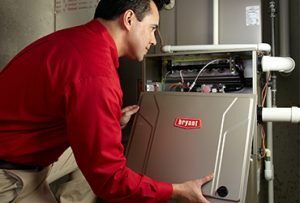 This is why we have chosen to partner with Bryant® Heating & Cooling products due to its brand reputation for quality and integrity. 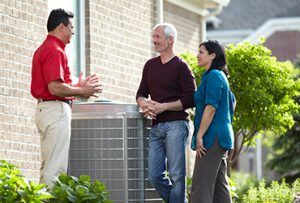 Why Is Daiker Among the Best HVAC Contractors in Waukesha? 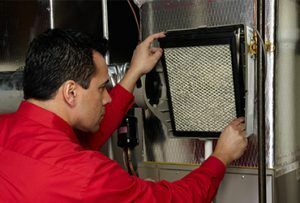 We are Waukesha’s furnace and boiler experts, so if you are hearing funny noises or it seems to take a long time to get up to the temperature you desire, call us. We will let you know whether a simple repair will fix the problem versus a new installation. And if it’s a heating emergency, call us now at 262-547-4803. Sometimes, we Wisconsinites wait to put the air on until we absolutely have to. And when that moment comes, you don’t want your air conditioning to fail. Call us for regular service to keep your unit up and running—and if you need a new unit, we can determine the proper size to keep your whole home cool. Do you have family members that are always sneezing or have stuffy noses? Or family members with allergies or asthma? Let us take a look to determine how we can improve your indoor air quality and get your entire family breathing easier. Our commitment to you is simple: quality craftsmanship at a fair price. Allow us to show you why we’re the premier heating, cooling, and indoor air quality company for Waukesha and the surrounding areas. We have a live dispatcher available 24/7 should you have a heating or cooling emergency. From furnace and boiler maintenance to brand new installations, our team at Daiker has you covered! Daiker Heating & Air Conditioning, Inc. Think you might need a new furnace or air conditioner? Give us a call at 262-547-4803 or contact us online to schedule an appointment. We will inspect your system to determine if it’s in good standing or not—and then recommend a repair or replacement if it’s needed. We also offer 24-hour emergency service with live answering to be there for you if you ever experience a breakdown.